With the Autumn well and truly upon us now, it’s worth looking at what the new season brings in terms of the new ranges of homewares and decoration. Homebase Wallpaper has been launched in 3 distinct looks and today’s Wallpaper Wednesday takes a look in detail at what they have to offer. The Homebase Anthology collection brings strong, dramatic prints in dark, bold colours bringing warmth and drama to your walls. 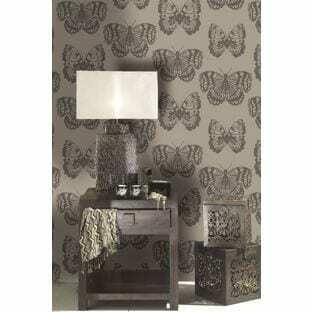 These prints will work well as statement wallpapers, on just one wall for impact combined with simple accessories. Opera Chinoise Shadow in Black, a subtle print in a soft sheen with real impact too. This is a really beautiful paper, not too feminine but modern and romantic and would look great in a bedroom. Trifari in Black is a beautiful large stamped butterfly on a bronze background and one of my favourites of all 3 collections. The Revival collection is calmer and softer than Anthology, with cool colours and relaxing prints, ideal for using on all walls in a room to add interest and texture. Superfresco Easy Nottingham in White is a beautiful, serene tree lined print ideal for a minimal, clean look with a hint of the outdoors. 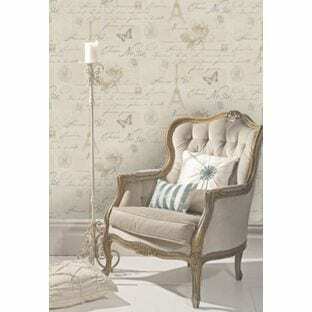 This one is a great paper for a downstairs room, working particularly well I think, in a living or dining area. 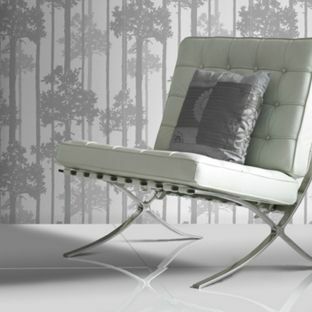 Mixed with modern furniture and accessories it would look particularly good with darker accents. Well the Scented Garden collection really does speak for itself. Full of romantic, soft flower prints that would work well in any home, they bring a little bit of the garden into your décor. Take Fine Décor Romance in neutral tones for example, a lovely soft rose like print that works beautifully in a bedroom or dining area. The neutral shades will tone well with soft wood furniture for a more classic look, but will work equally as well with modern, contemporary gloss white too. 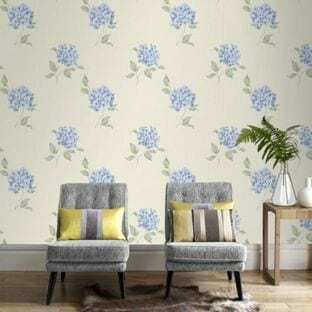 Fresco Mia Wallpaper in Duck Egg blue is a feminine and beautifully detailed floral full bloom print. The duck egg is soft enough to allow the wallpaper to be used on all walls but strong enough to act as a statement paper on just one wall as well. So what do you think of the new Homebase Wallpaper? I think it’s a great range and very reasonably priced too around £12.99 per roll. Although this can vary according to the season and sales. Last week I was at the Cosmopolitan Blog Awards in London, and was thrilled to win. Thank you to everyone who has voted or supported me. It’s been an interesting few months on the blog, where I’ve run some fabulous features and collaborated on some great projects. My Homebase Garden Makeover project has been a highlight of the summer and so I’m proud to collaborate further with Homebase following on from the Awards.